More Coffee Talk – COFFEE KLATCH COLLABORATION ANYONE? In response to More Cream in my Coffee over at Poetry Channel. and If You and I Were Having Coffee with Writing Wings for you. WE’VE GOT SOME COFFEE POEMS GOING ON. WHAT DO YOU HAVE? 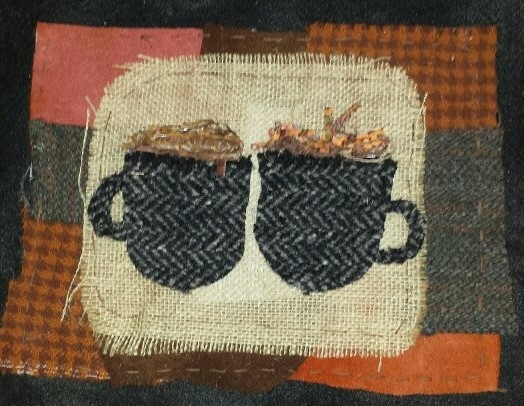 ***The above photo is from an art piece from my textile workshop. What I love about it is that it’s PERFECT in it’s IMPERFECTIONS just like me at Coffee Talk. Categories: Coffee Talk, collaboration | Tags: coffee talk, collaboration, poetry | Permalink. Agreed! Thanks for having a cuppa with us. Feel free to write your own coffee poem…I’d love to read it. Very good! I love coffee and writing! Well then you get to write us a little memoir then Andy! I’d love to read it. One will come soon my friend! I loved the jute piece and coffee talk both. I think I’ve found someone who likes coffee more than me! Pingback: Coffee Talk | See. Do. Conquer.